Ever dreamed of narrating your favorite novel as an audiobook? Or maybe you do the best cartoon robot voice your friends have ever heard. Do people in the grocery store ask if you’re on the radio or say you should be? Accents, dialects, languages, and voices of all kinds are undeniably in demand. VO might be a supplement for your day job, a weekend gig, or just your latest curiosity. Before someone else hears the magic in your voice, you’ll put in hundreds of hours of practice, production, and plain old rejection. But that’s how to become a professional talent. To become a pro without this kind of commitment, would be like asking an acorn to become an oak tree in a single season. Starting your voiceover career isn't about your demo. It's not about paydays, big, quick or easy. It's not about your mic or your branded website. Open your mouth right now and ask yourself aloud: What do I want to accomplish by working in VO? Yes, you'll need equipment. You'll need a coach you can trust, honest agents watching your back, and business smarts for a fast-paced world of self-promotion that moves like none other. Don't worry. We’ll guide you through all the ins and outs to get you started. But before the investment of your time and your money, invest in yourself. Speak up right now: My voice is worthy and I want to share it with the world! Hard to do? Sure it is. You’re directing yourself, putting your heart into the script and nobody is paying you a dime. STRAIGHT TALK: When it comes time to jump in the sandbox, you can audition 40 times or more [for free, it’s part of your job] and not land a single booking. Them's the breaks, acorn. Voiceover takes money, energy, patience and passion. It's bigger than you think, but it's smaller, too. You have a voice. And you are here. 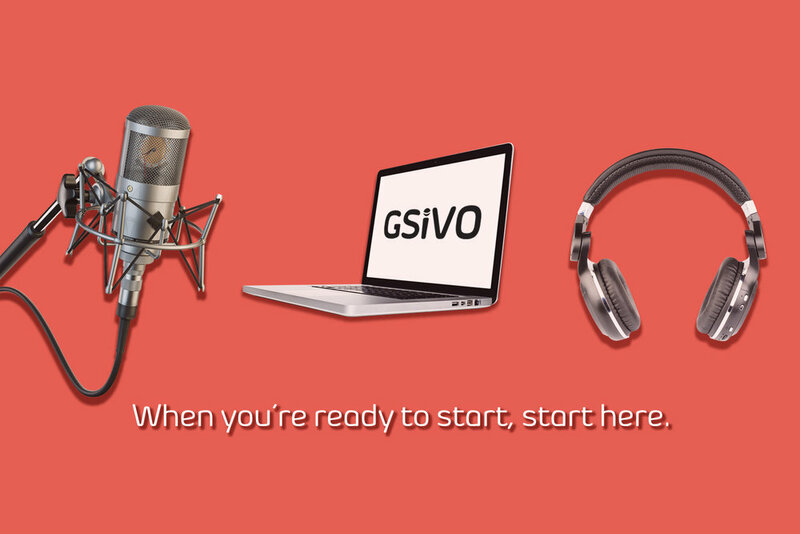 From A to B or bean to sprout, here are the first STEPS AND GOALS to GET STARTED IN VOICEOVER. Use this list to launch your journey, and you'll know if you want to pursue VO further. The Goal: Learn basic skills & tools; Get honest feedback & evaluation; Gather information about your next steps; Create a personal plan. + Do I enjoy being on mic? + Am I able to take the basic direction given at this early stage? + Am I excited at the thought of practicing outside of coaching sessions? The Goal: If “YES” then taking the next steps [outlined below] is a good idea. If “NO,” it’s okay! Voiceover isn’t going anywhere; you can always come back to it OR you realize that it’s just not what you expected. The Goal: To find the voiceover actor in you! Practice, experiment, play…GET COMFORTABLE WITH THE MIC. A “professional” home recording studio is not the goal of this step. The Goal: The ability to edit audio files and convert them to .mp3 audio files. The Goal: Remember, the name of this industry is voiceover ACTING and learning to act is necessary. The Goal: Understanding that this is a competitive business, so you have to feel motivated and find joy in the full picture, separate from thinking of it at this stage as just a future income. More resources and more guidance, including how to check in with the best guide on your VO journey—yourself! Ask Yourself: Did the class or workshop resonate with me? Is the coach a good professional match for my goals? Do they want a suspiciously-large amount of money right up front before they'll work with me? Are they producing a demo for me before any coaching actually happens? + Honest evaluation and feedback. + Tools, skills, and on-mic training. + Personal planning for career goals/next steps. Ask Yourself: Do I feel free to play, be loud, do silly voices and whatever it takes in my studio? How can I make a comfortable yet inexpensive space for myself, so I can spend my money on coaching and classes instead? + Private practice space where you can hone your skills. + To not break the bank on construction/equipment when just starting out. STRAIGHT TALK: It is imperative to have an acoustically sound recording environment once you start submitting for paid work - and this could mean a significant investment depending on your surroundings. Ask Yourself: Can I go from a script and my voice to an edited .mp3 file ready for submission to a client? Are there loud crackles, breaths, etc. in my file? What are the specifications for this job, and how can they guide me toward creating the best audition from the reads I've recorded? + To be patient: This is where technology meets your voice, and there's a learning curve. + To identify and edit together the best takes to create a whole audition. + Files to be cleaned of extra noise and pauses, but they don't need SFX or music. + To know that software/computer equipment can be surprisingly inexpensive. Ask Yourself: How can I bring what I'm learning in class behind the mic, even though it's a stage/on-camera or improv workshop? What tools, warm-ups and skills do I already know from my acting experience for relaxing into roles, analyzing scripts, etc.? + To understand how it translates to voiceover work, especially improv. + Confidence, expression and community. + To understand this is the backbone of your skills as a voiceover actor. Ask Yourself: Has my microphone stand become a coatrack? Is this a fun, invigorating new pursuit or a grueling rat race? Has the “homework” of coaching, classes and editing practice fallen off my radar? If I really want to do this work, what do I need to do to remove obstacles in my way? Say it: Practicing for voiceover work fills me with feelings of total ____. If you answered “dread,” that’s okay. We still like you, even if you don't love being a voice talent. + To trust it and own it; it's yours. Am I Still New at This or Am I Ready to Take on the World? What else can I do? Any low-cost advice? + It's your livelihood, so take care of it! Seek soothing tea, smoking cessation and cold/flu care as necessary. Like any part of the body, vocal cords need to be stretched, warmed up and treated gently when tired. + Assess the space—physical and mental—you enter when you record. The more work you get, the more time you'll be spending there. Let's be real: If you do not enjoy spending most of your time inside a small room, alone, self-directing, this is not the career for you. VO STRAIGHT TALK: Remember, it's a journey, not a treasure hunt. + Getting started in voiceover is about more than money. So is working in VO, at any level. Search for your authentic voice, for the feelings connected to the sound that makes people prick up their ears, not a dollar sign or a bottom-line. It's not just you: A majority of voice talent these days have other jobs, too. Ask Yourself: Now what? Am I ready to do what it takes for the next steps on my journey? + A distinct social presence. + A solid understanding of rates, terms and industry commerce. + A business and marketing plan. + Experience, confidence and passion. When ready, you’ll need help creating your brand, producing your demo, advice on contacting potential agents/clients in a positive, professional way…Keep your eyes on this site for expanded discussions on these important topics. Our VO STRAIGHT TALK blog will provide up-to-the-moment articles on how to get noticed the right way, direct from the industry's top coaches, agents and thinkers. Voice actors come hungry for this work; they have to. And there's no shame in working to feather your nest, or to put food on the table once you’re ready. Every project tossed out by Big Pay-to-Play [P2P] starts to look like gold when you're really hungry, and that's no joke. We hear you. It's hard to pass up practice on mic, especially when you can get paid to do it. The desire to get experience to compete for better jobs—the goa!—and a dose of fear makes the ease and speed of pay-to-play hiring sites tempting. Eventually, even those potential, low-paying gigs will add up to enough, right? Remember, you put the “pay” in pay-to-play, with your membership fee up-front. And you put in all the work. $150 for a project might seem mighty tasty now, but you have to successfully book each job first, and that means auditioning and submitting until you do. If you're flying without much experience, a mentor or an agent, familiarity with terms and contracts is a must: “unlimited edits/lifts/cut-downs/revisions, all media, worldwide use, in perpetuity” are NOT words pros say yes to for $150—or even $5k. It's your voice. You can say what it's worth. We know these terms might not be familiar, so here’s a handy Glossary of VO Terms for you. + VORateCard.com is the industry’s resource for up-to-date non-union rates, use and terms. + Union (SAG-AFTRA) and non-union are the two type of jobs in the industry. Some projects are only open to talent who are dues-paying members of the union. If you join SAG-AFTRA, you do pay into it, but have the opportunity to qualify for benefits like collective bargaining power and healthcare and pension. + Not all pay-to-play is big and sleazy. and casting platforms will shape the industry’s future. VoiceOvers.com is currently in beta and designed for vetted pros, Bodalgo - also pros, VOPlanet - again for vetted pros, and V123 are presently at the top of our “do” list. As in, if you DON’T see a site listed here, we urge you to think twice! VO STRAIGHT TALK: Our disclaimer is that you shouldn’t be listed on a pay-to-play site, auditioning for real jobs, until you are fully prepared. How's a newcomer supposed to get the experience to land tasty jobs? Of course, professional coaching is a must, but it's not the first step for most, and holding your own in a pro class when you're new can be daunting. It's been a catch-22 for too long. I'm brand new! How can I get the practice I need if I don't pay-to-play? I’m already a working voiceover talent, where should I go for practice and feedback? The whole world is enriched when we try new things. Wherever you go from here, thanks for exploring your voice with us. Wait — I’m ready for even more! Get all of the insight of VO STRAIGHT TALK right in your inbox! We respect your privacy and don’t share your info with anyone. Welcome! We heart voiceover too and can’t wait to share info with you! Do You Dream Of VO?